Just Looking: IT MAY BE EARLY, BUT THE HOLIDAYS WILL BE UPON US SOONER THAN YOU THINK! IT MAY BE EARLY, BUT THE HOLIDAYS WILL BE UPON US SOONER THAN YOU THINK! Looking for a super stocking stuffer? Try the ever popular, multi-purpose Bordeaux Balm, which actually does what it says it will and is why its fans scoop it up. This grape seed oil-based multipurpose balm is your beauty best friend -- it smoothes out the rough edges and offers relief for most skin situations, soothing, moisturizing, and protecting. Use on chapped lips, ragged cuticles, tough feet and rough hands. Also great for scratches, razor burn, sun burn, post-hair removal irritation, winter noses and most other skin discomfort. Try on eyelashes and eyebrows as nourishment and as a grooming aid. For shine, apply to any part of the face or body that needs a spotlight. In addition to grape seed oil, Bordeaux Balm is loaded with essential oils and natural ingredients, including coconut oil, aloe leaf extract, soybean oil and cotton seed oil. 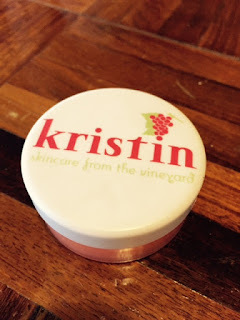 "Kristin: Skincare from the Vineyard" was founded by Kristin Moses Murray in 2006 when she could not find a grape seed oil-based multipurpose product to suit her beauty needs. A veteran of lifestyle and beauty public relations, Kristin worked long hours and traveled a great deal. Kristin saw that as she and her friends moved into the next phases of their careers, and some had children, time became a luxury. With each passing year, schedules were tighter - and beauty products and treatments were more necessary. Kristin thought there had to be a more streamlined method or a key ingredient that could target many needs and one that tapped into the magic and merits of grape seed oil. Grape seeds contain polyphenols and anti-oxidants, which help to nourish, smooth and moisturize the skin and the scent soothes the soul. Unable to find her dream product in the marketplace, Kristin decided to create a magic bullet herself with a multi-purpose product offering the benefits of grape seed oil, made for busy, beauty-conscious women. After nearly two years of research and development, Bordeaux Balm was born! Did I mention Kristin was my daughter? $12 plus $8 SHI to continental United States.